Rigby Muldoon: Time Traveller for Hire. Photo credit: Katie Cutting of Lazy Kitten Photography. An interview with Olivia Latta. In this noir-infused sci-fi comedy, aimless video game designer Annie Sinclair hires professional time traveller Rigby Muldoon to change her life’s path. With no one to trust and a futuristic police force hot on their trail, the unlikely duo are transported back to 1995, with only their wits and their laser tag skills to protect them. Can Annie really change her past? Will Rigby be able to keep his buried? And will they figure out who’s lurking in the shadows and pulling the strings before it’s too late? Only time (pun regrettably intended) will tell! Rigby Muldoon: Time Traveller for Hire had a staged reading as part of NextFest 2015 – how did that staged reading assist in the production audiences will see this Fringe? The staged reading helped immensely! We were struggling with a lengthy script and the trouble of “how much of the time travel science do we actually need to explain to the audience”. We went in hoping to get a lot of questions answered and were pleasently surprised. We learned that we could say to the audience “this is just the way the science works, and if you don’t fully follow that’s ohkay” without loosing to many of them. It also helped us clear up which jokes would land, and which were jokes that we liked but weren’t honestly working. I think without the read, the caliber of the play would not be near what you’re actually seeing at the Fringe. 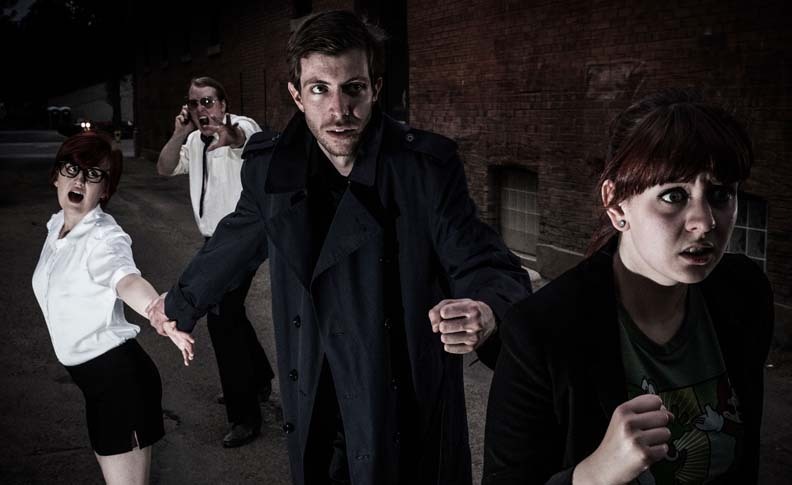 Rigby Muldoon: Time Traveller for Hire combines the genres of noir and sci-fi. What about these two genres works so well for you in this show? I think the noir genre really helps with the accesibility of the play. The concept of time travel can be a really cool one when done well, but some people just aren’t into it. But infusing that noir-style quality drops in those characters that people recognize as being parodied in a lot of other shows/plays/movies. And being able to really play up some of the noir stereotypes with the contrast of the futuristic quality of sci fi really helped develop a lot of the comedy within the show. One of your main characters, Annie Sinclair, is trying to change her life path through rather drastic measures – time travel. Why did you decide to use this as a catalyst for the action of Rigby Muldoon? Again, I think it’s because it’s so relatable. We’ve all been in a place in our life or had an embarrasing moment that we wish we could go back and change. And that fact that Annie wants her life to change so badly that she’s reached out to this ridiculous option of travelling back in time works so well with us really playing up some of the traditional film noir characters. Because they too are a little ridiculous. And it really helps with the logic of the whole thing. Why would any sane person start running about with a crazy man who claims he can time travel? Because she’s that desperate. It really is just as much of a detective story as a sci fi play. There’s a lot of stage fighting, a lot of laughs, a lot of heart warming moments, and there’s even POG’s. We’d just like to give a shout out to Farrow and Accent Lounge for sponsorsing the show.